Last year we initiated LEPC-1, a novel unification of law, economics and public policy. The program for the 2017 conference is now up. The impact of the GST on Indian investment by Gaurav S. Ghosh in NIPFP YouTube Channel, November 29, 2017. Shun rhetoric, appreciate IBC problem by Somasekhar Sundaresan in Business Standard, November 28, 2017. Safety Trends and Reporting of Crime - A crime victimisation survey by Avanti Durani in NIPFP YouTube Channel, November 27, 2017. The Serial-Killer Detector by Alec Wilkinson in The New Yorker, November 27, 2017. An Indian spot currency trading platform by Bhargavi Zaveri and Radhika Pandey in Business Standard, November 27, 2017. Initial Coin Offerings Horrify a Former S.E.C. Regulator by Nathaniel Popper in The New York Times, November 26, 2017. The Quiet Rivalry Between China and Russia by Robert D. Kaplan in The New York Times, November 3, 2017. Drones are taking to the skies above Africa to map land ownership by Robert Wayumba in The Conversation, November 26, 2017. Measuring the drama in the economy by Ajay Shah in Business Standard, November 26, 2017. The simple economics of clean air by E. Somanathan and Ridhima Gupta in The Indian Express, November 23, 2017. Time to change the House rules by M.R. Madhavan in The Hindu, November 22, 2017. Resource constraints in the delivery of maternal and child health by Anjini Kochar in NIPFP YouTube Channel, November 19, 2017. This Gene-Editing Tech Might Be Too Dangerous To Unleash by Megan Molteni in Wired, November 16, 2017. How can we deter crime? by Ajay Shah in Business Standard, November 13, 2017. Meet Arun Chandra Mukherji, the grand old man of India's insurance industry by Subhomoy Bhattacharjee in Business Standard, November 3, 2017. Robert Mueller's Brilliant Strategy for Outmaneuvering Trump Pardons by Jed Handelsman Shugerman in Slate, November 3, 2017. The problem with 'tribunalisation' by Somasekhar Sundaresan on Wordpress, November 2, 2017.
by Gaurav S. Ghosh and Jack Mintz. The most wide-ranging change to the Indian tax system in decades is the introduction of the goods and service tax (“GST”). But is this tax beneficial or harmful for investors, especially for new investment? Is the GST impact uniform across sectors, or does it favour in some sectors while harming investment in others? India’s GST reform has integrated state level sales taxes and central excise and service taxes into the GST, which is a centralized value added tax (“VAT”) and enables businesses to claim more refunds of taxes paid on purchases from other businesses. It removes a significant amount of taxes on business inputs that are cascaded into business costs and passed on to consumers or businesses purchasing goods and services from other businesses. Some non-refundability of input taxes remain for exempt sectors such as agriculture, petroleum and alcohol. Generally, though, the Indian VAT reform will result in a signficant reduction in VAT on business input costs as we show below. We report results from our recent study where we evaluate the cost burden placed by India’s tax code upon potential investors, both before and after the introduction of the GST. We do this by developing an economic model that is calibrated to represent the Indian tax system, and then using this model to simulate GST impacts. The model and its implementation are described below. This is followed by discussion of our results. Our tool for evaluating the impact of the Indian tax system on investment incentives is the Marginal Effective Tax Rate (“METR”), which measures the tax wedge imposed upon investment. The METR is an analytical framework developed in the 1980s to evaluate tax systems in their aggregate and to facilitate cross-country and cross-sectoral comparisons. Seminal METR studies from this era are Auerbach (1983), Boadway et al. (1984) and King & Fullerton (1984). The METR has since been used by academics and governments to evaluate tax competitiveness, gauge the economic impacts of changes to the tax code, and design investment-friendly tax policies. The METR analytical framework is useful because it provides a strong empirical basis to tax policy debates. It has proved itself over the years by being used by policy makers worldwide. Ours is the first in-depth implementation of the METR framework to the Indian economy. The tax wedge, $\omega$, estimated under the METR framework, is the difference between the pre-tax rate of return earned by a marginal project, $r_g$, and the post-tax rate of return that accrues to the marginal project’s investors, $r_n$. The METR itself is the tax wedge divided by the pre-tax rate of return. The sizes of the tax wedge (and the related METR) is affected by direct taxes, sales taxes on capital purchases and other capital-related taxes like stamp duties. The METR also accounts for tax incentives including accelerated depreciation, initial allowances, and tax credits. High METRs imply high tax loads and low returns to investors and vice versa. High METRs therefore indicate that the associated tax systems are less competitive when it comes to attracting capital investment. Estimating the METR for a marginal project requires the estimation of $r_g$ and $r_n$ for that project. In the METR framework, both variables are functions of a wide array of tax rates and incentives; the functional forms are derived through recourse to standard microeconomic principles and assumptions. We do not provide technical details here. Interested readers can refer to Ghosh & Mintz (2017). We only note that the post-tax rate of return $r_n$ is equal to the inflation-adjusted market interest rate for issuing bonds and equity finance, which is the same across all businesses net of risk. The pre-tax rate of return, $r_g$, is estimated by estimating the user cost of capital model (Jorgenson, 1963) net of depreciation and risk. The Indian tax system therefore affects the estimation of $r_g$ and $r_n$ – and by extension, the estimation of the METR – because of its impact on the real market rate of return and the user cost of capital within the structure of our model. METR estimation requires consideration of the marginal investment that earns a pre-tax rate of return sufficient to cover taxes and the market rate of return. The marginal investment depends on the characteristics of its industry and the choice of production technology. Every sector, in effect, has a multitude of marginal investments varying across characteristics like industry, asset class and financing structure. Each marginal investment has a different METR because it faces a different tax treatment once all relevant taxes, exemptions and their interactions are considered. Debt-financed transportation in the power sector will, for example, have a different METR than equity-financed machinery in the agriculture sector. There are multiple reasons for this: the differential treatment of debt and equity in the Indian tax code where interest payments are deductible, but dividends are not; the different incentives available to investors in the power and agriculture sectors; and the differential tax treatments of asset classes. Accurate estimation of the METR, whether at the sectoral or all-India level, requires consideration of this heterogeneity across different types of marginal investment. Consistent with the literature (King & Fullerton, 1984; Mintz, et al., 2016), we estimated METRs by using a bottom-up approach. First, we identified four key tax and economic characteristics of a marginal investment in India. These were sectors, asset types, investment sizes, and whether the marginal firm was paying the corporate income tax (“CIT”) or the minimal alternate tax (“MAT”). Each marginal investment would have some level of each of these characteristics. Second, we identified the number of levels for each characteristic. There were nine sectors, six asset types, two firm sizes and two types of tax payers, as shown in Table 1, leading to 216 unique marginal investments. The identified sectors (except “Others”) were the main investment destinations in India, accounting for 93 percent of investment in 2015 among firms in the Prowess database. The asset types were those identified for differential treatment under the Indian tax code. Firm size was selected on the basis of the investment threshold for initial allowances: these are only allowed for investments exceeding INR 250 million. Third, METRs were estimated for each of the 216 marginal investment types. This required collection of tax and economic data for each type, and then the incorporation of this data into the formal METR model. Finally, METRs were calculated at different levels of aggregation as weighted averages of subsets of the 216 types. 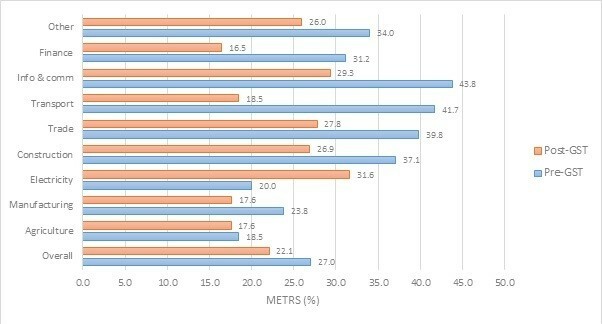 For example, the all-India METR was a weighted average of all 216 METRs, while a sectoral METR was a weighted average of the 24 METRs relevant to that sector. The weights used were the capital shares associated with each marginal investment type. The capital share was the proportion of all new investment capital in a given year that was allocated to a given marginal investment type. The capital share data and certain other data were obtained from the Prowess database. Other data sources were the Indian Income Tax Act, tax guides published by EY and other accounting firms, official Indian government communications, the Thomson Reuters EIKON financial database, and publications by the Central Statistical Office. Some results from our analysis are presented below. We begin with a comparison of METRs before and after the implementation of the GST, which is shown in Figure 1. We compare METRs both at the all-India level and at the sectoral level. The blue (red) bars represent pre-GST METRs (post-GST METRs). We see that the GST leads to a fairly large drop in METRs at the all-India level, from 28% to 22%. This is because the GST removes pre-GST blockage of many input tax credits. Many of the blockages arose because different indirect taxes – such as state VAT and central excise and service taxes – could not be set off against each other. Consider the plight of a services firm, which paid state VAT on some inputs, but collected central service tax from its customers. Since state taxes were not creditable against central service taxes they were blocked, leading to tax cascading. Unable to claim credit for state taxes paid, the firm’s input costs would be higher by the amount of the blocked taxes. This higher tax burden would lead to a higher METR. Post-GST, the distinction between central and state taxes vanished and therefore many blockages and cascades also vanished. Other blockages arose because of exemptions granted under the pre-GST system. It is a common misconception that tax exemptions are business-friendly. Nothing could be further from the truth. Since the exemption recipient does not pay the output tax, it cannot set off its input taxes. All input taxes in exempt sectors are therefore blocked and lead to a higher METR on investment. The GST has retained some previous exemptions, such as in the agriculture sector, but has removed others. This has contributed to the overall drop in the METR. We also see that METRs are heterogeneous across sectors. Pre-GST, METRs were lower in production-related industries than in service industries. Production sectors may have had lower METRs, but for different reasons. Manufacturing benefited from relatively low central and state indirect tax rates, as well as few input tax credit blockages. This is because most investment in the manufacturing sector is into machinery and equipment (“M&E”), which had relatively favourable tax treatment. Agriculture and electricity, on the other hand, were exempt sectors and therefore had blocked credits. However, these sectors received other benefits from the tax code that, together, brought down their METRs. Agriculture was exempt from the corporate income tax, while electricity benefited from large tax depreciation allowances and (like manufacturing) low indirect tax rates on M&E. The service industries had higher METRs because they faced higher taxes on their inputs as well as greater blockages on input tax credits. The asset mix for the service sectors consisted of comparatively less M&E (with the exception of finance) and more of other assets like land, buildings, transport and inventory. The pre-GST tax treatment of these other assets was relatively less favourable than for M&E. When comparing pre- and post-GST METRs, two results stand out. First, METRs have reduced for all sectors with the sole exception of electricity (to be explained below). Second, the size of the METR reduction varies across sectors with the reduction being higher in the service sectors than in the production sectors. As a result, although variations in METR persist in the post-GST era, the size of these variations has reduced, with the specific result that the tax competitiveness gap between the production and service sectors has also reduced. These results can be unpacked. Perhaps the most notable result in the figure above is that the GST raises the METR in the electricity sector, while reducing it in others. Pre-GST, the electricity sector faced two distortions: sector-specific indirect tax incentives and blocked input tax credits. The former was beneficial and the latter harmful from an investment (and METR) perspective. The two distortions cancelled each other out, leading to a relatively low METR of 29%. Post-GST, the beneficial sector-specific incentives were removed while the harmful blockages remained. As a consequence, the METR increased sharply in this sector to 38%. The services sectors benefited more from the GST because they were the ones for whom blocked credits were a greater problem in the pre-GST era. This led to a reduction in the tax competitiveness gap between the services and production sectors. The merits and demerits of the GST have been debated vigorously in the press and among the policy community in recent months. We contribute to this debate by presenting the results of the first (to our knowledge) empirical investigation of the impact of the GST on the incentive to invest in India. We find that the GST does improve investment incentives at the all-India level by reducing the marginal effective tax rate or METR from 28% to 22%. This is achieved through a reduction in the blockages of input tax credits across value chains and a reduction in indirect tax exemptions. The all-India METR numbers mask heterogeneity at the sectoral level. Pre-GST, the Indian tax code incentivized investment in production sectors like manufacturing and electricity through lower METRs, while the tax cost of investment was relatively higher in service sectors like transport, information & communications and trade. Post-GST, this pattern of incentives has changed. While METRs for manufacturing remain low, METRs for the power sector have increased significantly. METRs for the service sectors have also come down sharply post-GST. METRs in some service sectors like finance and trade are now roughly equal to that for manufacturing. In summary, the GST has reduced the overall tax cost of investment in India and reduced investment distortions in the tax code, somewhat levelling the playing field between the production and service sectors as destinations for investment. This is good news, but we caveat it by pointing out that the full potential of the GST as an incentive for investment has not been reached. We have unreported results that show that METRs would come down further – particularly in the electricity sector – if the remaining exemptions were removed. Auerbach, A., (1983), Taxation, corporate financial policy and the cost of capital, Journal of Economic Literature, 21(3), pp. 905-940. Boadway, R., Bruce, N. & Mintz, J., (1984), Taxation, inflation, and the effective marginal tax rate on capital in Canada, Canadian Journal of Economics, 17(1), pp. 62-79. Ghosh, G. & Mintz, J., (2017), Investment and the Indian tax regime: Measuring tax impacts on the incentive to invest in India, Bangalore: EY. Jorgenson, D., (1963), Capital theory and investment behavior, American Economic Review, Volume 53, pp. 247-259. King, M. & Fullerton, D., (1984), The taxation of income from capital: A comparative study of the Unites States, the United Kingdom, Sweden and West Germany, Chicago: University of Chicago Press. Mintz, J., Bazel, P. & Chen, D., (2016), Growing the Australian economy with a competitive company tax, Sydney: Minerals Council of Australia. Gaurav S. Ghosh is Senior Manager, Ernst & Young, LLP and Jack Mintz is Palmer Chair in Public Policy and Director, School of Public Policy, University of Calgary. The content of this blog is in the public domain and is being used by other websites and media organisations widely. The rules of the game for syndication were modified today. Bank credit to the economy has slowed down. In 2016-17 (year-on-year as at September), overall bank credit grew at 4.2%, compared to 11.5% in 2015-16. Credit to industry has been stagnant for the last two years. It contracted by -0.4% in 2016-17, and grew only at 0.8% in the previous year. For an economy where banks account for more than 65% of the domestic credit, this is bad news. A major reason for the slowdown in credit is the stressed assets of banks, mainly Public Sector Banks (PSBs). Stressed assets put a strain on the capital adequacy of banks and affect their ability to lend. How much capital do PSBs need to meet regulatory capital standards? When will PSBs have growth capital? How certain is the recapitalisation package? Will the recapitalisation package provide growth capital? Most listed entities, including PSBs make detailed presentations on their performance to analysts every time they disclose their quarterly or annual results. These presentations, where PSBs disclose details about their business prospects, profitability, asset quality and capital adequacy, are available on their respective websites. For our analysis, we use information disclosed by 21 PSBs in their analyst presentations for the quarter ending June 2017. Q1. What is the impact of stressed assets on PSBs' capital? When a bank provides for losses against stressed assets, its Tier I capital gets affected. This is because Tier II capital is often in the form of bonds issued to investors, which the bank cannot default on. Unless specific loan loss reserves have been created as part of Tier II capital, any additional provision reduce the bank's Tier I capital. Table 1 shows the stressed asset and capital position of PSBs as at June 2017. PSBs held a total capital of Rs. 7.2 trillion. Out of this, Rs. 5.6 trillion was Tier I capital. Against this stock of Tier I capital, PSBs will face additional provisioning requirements from two sources: (1) their current stock of stressed assets, and (2) any future addition to stressed assets. In June 2017, the stock of stressed assets at PSBs was Rs. 8.9 trillion. Of this the banks had not provided for Rs. 5.8 trillion. The provisioning requirement for these assets will depend on expected recovery rates. Table 2a shows this requirement under three scenarios of recovery rates, ranging from 20% to 40%. It shows that if banks expect to recover Rs. 20 for every Rs. 100 of their portfolio of stressed assets, they will need to make additional provisions of Rs. 4 trillion. If they expect to recover Rs. 40 for every Rs. 100, they will need to make additional provisions of Rs. 2.2 trillion. The important question here is: what is a plausible recovery rate for the current stock of stressed assets of the PSBs? Around 70% of their stressed assets are from loans to the corporate sector. Many of these loans have seen multiple attempts at restructuring under the 5/25, Corporate Debt Restructuring (CDR), Strategic Debt Restructuring (SDR) and S4A schemes initiated by the Reserve Bank of India. The companies to whom these loans have been made are distressed, and have remained unresolved for several years. For most of these cases, even a recovery rate of 20-30% seems optimistic. It is worth mentioning here that the resolution of many of these distressed companies will be under the Insolvency and Bankruptcy Code, 2016 (IBC). Till 8th November 2017, 391 IBC cases had been admitted at the National Company Law Tribunal (NCLT). Data on bank borrowings is available for 150 of these. The banking sector exposure to these companies is around Rs. 2 trillion, and a large chunk of it is in the PSBs. Even assuming that banks have already made 50% provisions against these loans, around Rs. 1 trillion still needs to be provided for. If the IBC results in a liquidation outcome for these companies, the recovery rates may be even lower than the anticipated 20-30% and hence the provisioning requirement will be higher. Addition to the existing stock of stressed assets is also highly likely. There is trouble brewing in the Telecom sector and there are reports that RBI has identified a new list of 40 large companies for referral to the IBC by December 2017. PSBs will face further provisioning requirement for these cases. Table 2b shows the impact of the existing stock of stressed assets on the Tier I capital position of the PSBs. Additional provisions of Rs. 3.1 trillion (at a recovery rate of 30%, from Table 2a) will deplete PSBs' Tier I capital to Rs. 2.49 trillion. This will bring their Tier I Capital Adequacy Ratio (CAR) to 4.2%, which is below the CAR requirement imposed by regulatory standards. Q2. How much capital do PSBs need to meet regulatory capital requirements? Table 2b shows the amount of capital that is needed to bring the PSBs to a Tier I CAR of 9%, after making provisions for the existing stock of stressed assets. This is just enough to fill the current capital shortfall. It does not account for any further increase in stressed assets. It also does not leave any headroom for incremental lending. At an expected recovery rate of 30% for the existing stressed assets, PSBs will require Rs. 2.82 trillion of additional capital to get to a Tier I CAR of 9%. If the recovery rate falls to 20%, the additional capital required will increase to Rs. 3.72 trillion. Every 1% increase in the stressed asset portfolio of PSBs will create an additional capital requirement of Rs. 0.4 trillion, at an expected recovery rate of 30%. Q3. When will PSBs have growth capital? PSBs require capital to: (1) fill the gap created by their existing stock of stressed assets, (2) deal with any future addition to their stressed asset portfolio, and (3) support growth in credit. The capital required for growth in credit has to be over and above what the banks need to deal with their stressed assets and to maintain the regulatory capital standards. The stressed assets of the PSBs are currently at 15.6% of their gross advances. Even if we assume that this does not increase beyond 18%, the capital required only to deal with current and future stressed assets will be Rs. 3.4 trillion at a recovery rate of 30%. To achieve a 10% annual growth in advances over the next two years, PSBs will require additional capital of Rs. 1.1 trillion (at a CAR of 9%) over and above the requirement for stressed assets. Assuming that stressed assets at PSBs have peaked and will not impose a significant burden on future capital requirements, PSBs will require additional capital of Rs. 4.5 trillion to grow at 10% in the next two years. At this level, they will be able to deal with their stressed assets, and be able to lend again. Q4. How certain is the recapitalisation package? Equity capital of Rs. 0.58 trillion to be raised by PSBs from the capital market. Of the three elements of the scheme, the first two are certain. However, there are doubts about the ability of PSBs to raise Rs. 0.58 trillion from the market. A CAG report released in July 2017 reviewed the implementation of the capital infusion plan under the government's Indradhanush plan. The Indradhanush plan was initiated by the government in August 2015 to revamp PSBs. Under this plan, the government estimated that PSBs would require additional capital of Rs. 1.8 trillion till FY 2019. Of this Rs. 0.7 trillion was to come from fiscal allocations over a four-year period. PSBs were required to raise the remaining Rs. 1.1 trillion from the capital market. The CAG report found that till March 2017, PSBs had been able to raise only Rs 0.07 trillion, or 6.3% of the capital to be raised from the market. In FY 16, the total size of the equity issuance market was Rs. 0.46 trillion. In FY 17, it is expected to be Rs. 1 trillion. Even at 2017 levels, the capital requirements of the PSBs are 60% of the entire market. The ability of all 21 PSBs to raise capital is not uniform. The PSBs that have the highest levels of stressed assets, and hence the most urgent need for additional capital, may find it the most difficult to raise capital from the market. Rs. 1.53 trillion of the Rs. 2.11 recapitalisation plan is certain. The remaining Rs. 0.58 trillion will depend on the ability of the PSBs to successfully access the capital market. Q5. Will the recapitalisation package provide growth capital? As our estimates show, the recapitalisation package of Rs. 2.11 trillion is not sufficient to cover even the additional capital of Rs. 2.82 trillion required by the PSBs to provide for the existing stock of stressed assets and meet regulatory capital requirements (from Table 2b, at 30% recovery rate and 9% Tier I CAR). It does not come close to providing the PSBs with the headroom required to grow their advances. Even at conservative estimates of growth in stressed assets, for bank advances to grow at 10% over the next two years, PSBs require Rs. 4.5 trillion of capital. This means that the government needs to provide the PSBs with a Phase II recapitalisation of Rs. 2.39 trillion, over and above the Rs. 2.11 trillion already announced in Phase I. If the PSBs fail to raise Rs. 0.58 trillion of the Phase I recapitalisation plan from the market, the Phase II requirement will increase to Rs. 2.97 trillion. The government has announced a recapitalisation plan for PSBs. Our analysis shows that the quantum of this recapitalisation is inadequate. The capital shortfall faced by the PSBs from their stressed assets is larger than the capital infused. A second round of recapitalisation, perhaps even larger in quantum, may be required before the PSBs can revive their stressed balance sheets and start lending to the economy again. Rajeswari Sengupta and Anjali Sharma are researchers at Indira Gandhi Institute of Development Research, Mumbai. The authors would like to thank Harsh Vardhan and Josh Felman for useful discussions. by Adam Feibelman and Renuka Sane. There is speculation that the Government will amend the Insolvency and Bankruptcy Code to prohibit promoters from bidding on their firms in the insolvency process. This is to avoid letting owners of an insolvent firm effectively repurchase their firm or its assets at a discount after shedding debts that the firm had incurred under their control. The objective is to also ensure that lenders do not persist with ever-greening their loans when there may be no collective financial justification for doing so. We appreciate the appeal of such a rule, especially when cases of dramatic promoter malfeasance and mismanagement, and ever-greening of loans by banks are fresh in our minds and all too common. But we worry that the change proposed by the Government would sacrifice potentially beneficial aspects of the Code to avoid something that can be dealt with through more modest reforms, some of which can be done through regulations and would not require reform of the Code. In fact, the Insolvency and Bankruptcy Board of India (IBBI) has already taken the step of amending its rules to ensure that promoters proposing turnaround plans for their sinking companies will be subjected to a stringent test of creditworthiness and credibility. It is true that promoters who run their businesses into the ditch through fraud or mismanagement should probably not be able to employ the IBC in concert with aligned creditors to simply shed their obligations and continue on their merry way. financial distress due to factors beyond their control or that they could not reasonably be expected to have anticipated. Others will have made avoidable but forgivable mistakes. The Code makes it very easy to force such firms into insolvency - a single default on a single debt suffices. In such an event, scrupulous and competent promoters may get permanently excluded from participating in their firms going forward if the reform under consideration is adopted. This might disincentivise good promoters from entering into businesses in the first place or from borrowing in arms-length transactions, either of which would impede the culture of entrepreneurship and the environment for start-ups that the government wishes to encourage. If this were only a question of the potentially harsh treatment of those promoters who are neither incompetent nor unscrupulous, we might consider that this could be an unfortunate but necessary aspect of the new insolvency and bankruptcy system. Law often imposes some unpleasantness in the service of avoiding greater harm. predictably externalize losses on others and on the broader system. Promoters are often in the best position to turn their firms around, and occasionally they are essential to that outcome. In other words, excluding promoters from the process will make it harder to reorganize some firms that have experienced insolvency or financial distress, something that is hard enough to do with access to all available human resources. prefer to have the promoters continue to be involved with a firm that is in financial distress, they might avoid using the new insolvency system at all, or dismiss cases strategically, undermining the scope and effectiveness of the new Code. A rule excluding promoters from potential bidders in the insolvency process is not even necessary to achieve its purpose of protecting the system from unscrupulous or incompetent promoters. If the concern is that some promoters will effectively collude with creditors to take advantage of the new system to take their firms back after shedding debts, or that the inclusion of promoters in the bidding process will discourage or scare away other potential bidders, there are other ways of addressing such threats. The US bankruptcy system, for example, has addressed this problem by allowing preexisting shareholders to have a stake in a reorganized firm if they put in new value equivalent to their new stake and if the reorganization plan was open to other potential bidders. Additionally, if a class of creditors objects to the plan, the presiding bankruptcy court must determine that the reorganization plan involving the preexisting shareholder is neither unfair nor discriminatory to the objecting class. These rules are not without controversy in the US, but they reflect a reasonable approach to constraining shareholders' participating in reorganized firms without banning them from doing so altogether. Protections of this kind could easily be incorporated into India's new insolvency and bankruptcy system. Promoters could be allowed to submit bids, for example, only if an independent resolution professional is assigned to the case by the Insolvency and Bankruptcy Board. The resolution professional and the NCLT could be required to ensure that the promoters put up new value equivalent to their stake in the reorganized firm and strictly review other aspects of the resolution plan and the process of its approval by the creditors committee. insolvency cases and what happens to debtors within the system. This system is thus built on the logic that creditors as a group know what is in their best interest and that it is possible to protect smaller creditors in the process. If policymakers are not comfortable letting creditors decide whether the promoters should participate in their reorganized firms, this suggests a lack of confidence in the new system and the various actors and institutions that operate it. To date, the new system has performed surprisingly well, given the huge challenges that faced it upon inception. It seems too early to let a lack of confidence erode the basic approach and potentially undermine the ability of the new system to restructure firms that will have significant going concern value when their promoters stay involved. Furthermore, because it is easier under the Code for any creditor to force a firm into insolvency much sooner than before, it is also possible that the underlying problem of fraudulent and unscrupulous promoters will lessen over time. The recent steps taken by the IBBI are in the right direction, and it seems sensible to wait and see if they are sufficient as the new system matures. Adam Feibelmen is a Professor of Law at Tulane University, he was a visiting scholar at National Law School of India University, Bangalore, and the Center for Law and Policy Research in 2016. Renuka Sane is faculty at the National Institute of Public Finance and Policy. by Monika Halan and Renuka Sane. In any market, including the market for financial products, we expect that consumers read and understand disclosures about products, weigh the costs and benefits, and make an informed choice regarding purchase. Financial firms, however, respond to disclosure requirements by showing customers large quantities of paper full of jargon. Disclosures become obfuscated, and product features, terms and conditions, hard to decipher. There is also an information overload. Even highly financially literate customers find it difficult to read and understand what is on offer. They make decisions that they often come to regret as product outcomes unfold. Firms claim that customers had signed off on having understood all terms and conditions, leaving little recourse to customers. In this context, a 2015 Ministry of Finance Committee set up to, 'Recommend Measures for Curbing Mis-selling and Rationalising Distribution Incentives in Financial Products'(also known as the Bose Committee) made several recommendations on improving product disclosures. Many regulators in India have continuously made changes to their disclosure regulations in order to improve consumer protection outcomes. One would find it hard to argue that disclosures shouldn't be better designed. The devil is, however, in the details. How do we design effective disclosures? Even if disclosures are made simple, would consumers pay attention to them? Would they change behaviour because of the disclosures? How have customers reacted to changes in disclosure regulations? What have we learned about what kinds of disclosures would have the desired effect? What more do we need to understand? How does this shape our thinking about financial regulation? In a recent paper, Regulating consumer finance: Do disclosures matter? The case of life insurance, we use a sample-survey based experiment to understand the effect of simplified disclosures on an endowment insurance product. We chose an endowment insurance product as this is a composite product that bundles insurance and investment, that often has a detrimental impact on potential returns which customers may not be aware of. Product brochures also showcase returns not on the amount invested, but on sum assured, making it difficult for customers to decode the real costs and benefits of the policy. This product has some of the most opaque disclosures as compared to other financial products in the market such as mutual funds, pension funds and small saving products such as the Public Provident Fund, or the National Savings Certificates. We conducted household surveys in the cities of Mumbai and Delhi. The survey captured demographic and socio-economic details of the respondent such as age, gender, marital status, education, occupation, and household income. It also asked questions on attitudes to risk, retirement, basic questions on financial literacy, and prior purchase of insurance. We then offered customers a product brochure which consists of an investment of INR 50,000 a year for 5 years, with a tax break on income, and tax-free returns, INR 500,000 life insurance cover for 15 years, and regular money back across the life of the policy. We randomised survey respondents into one of four product advertisements (Treatments): 1) a baseline product with no additional disclosure, 2) disclosure of the actual rate of return on the product, 3) disclosure of the rate of return and a benchmark return of a similar product, namely the Public Provident Fund (PPF), and 4) the rate of return, benchmark return and product features of a more cost-effective competing term insurance product. We then asked respondents: did they think that the product was a "good" product? Would they consider purchasing this product? If not, why not? We chose these disclosures because when a customer buys a financial product, she must look at several attributes. The most easily understood attribute is returns. But bench-marking those returns to an industry standard, comparing to an alternate investment and mapping real return are some of the key determinants to rational consumer choice. Investors, should ideally, look for and use all these metrics of information. Our treatments, therefore, progressively added information on these attributes to map the impact on potential buyers. We expected approval rates for the products to drop drastically for those in Treatment 4 over Treatment 1. The group which saw the disclosure related to the rate of return on the insurance product (Treatment 2), was 2.6 percentage points less likely to think that the product on offer was a 'good' product relative to the group that saw the baseline product with no additional disclosure. Treatments which show additional data such as a comparison rate of return, or the price of a term insurance plan had no effect relative to Treatment 1, which had no additional disclosures. Those with a higher score of financial literacy, and greater concerns about retirement react to the disclosure only in Treatment 2. Surprisingly, non-purchase of insurance in the past matters for effectiveness on product perception. None of the treatments had an impact on the intention to purchase. When respondents were given more than one piece of information, such as the rate of return plus benchmark, or the rate of return plus the benchmark plus the price of a pure risk product, they seem to have tuned out. Disclosures appear to work only when it is about a product feature customers know and understand. The concept of returns is something most people understand, and hence they are able to digest it quickly. Basic financial numeracy and retirement preparedness help towards recognising the returns disclosure but not much else. The results of this experiment were contrary to our expectations that clear disclosures will change investor perception. The only disclosure that was read and understood by customers was that of returns. This suggests that for disclosures to have any effect, customers need to have a minimal understanding of the product features that are being disclosed. These results make us pause about the role of disclosures in consumer protection regulations in finance. It is tempting to require financial firms to keep improving their disclosures. But if disclosure regulations are not based on sound research of what really works, then we are imposing an unnecessary burden on financial firms, and ultimately consumers. What we need is a continuous and systematic process of design and evaluation of disclosures. This requires thinking on what makes a good disclosure, and whether the disclosure is having the desired effect. In parallel, we must think about other measures that can improve customer's ability to understand the various disclosures. For example, it would be insightful to evaluate if after some basic financial literacy training on what makes a good financial product, buyers are better able to understand disclosures, and make more informed choices. Monika Halan is Consulting Editor, Mint, New Delhi. Renuka Sane is a researcher at the National Institute of Public Finance and Policy, New Delhi. We thank Smriti Parsheera for useful comments.